Other Twitter distribution systems like Thunderclap can blast out messages, but they require every participating Twitter account to register for several weeks before all the tweets are distributed simultaneously. The BNN can deliver news massively in real time at levels comparable to Thunderclap (and we’ll do this for any organization who needs to get their word out quickly across 350 cities, just ask). It’s especially useful for testing and evolving messaging around crowdfunding campaigns. However, massive media distribution is only the first order of influence. We’re the first to caution that Twitter campaigns don’t generally lead to immediate results like a desired transaction (purchase, donation, share). Old school marketers still like the idea of a Thunderclap or a Twitter blast across 350 cities because they perform like a traditional advertising campaign with quantifiable social reach. But like advertising, the “blast” is about exposure of the message; the more valuable stage of social media influence is engaging the right people, the target group. We reach this next stage of influence by coordinating amplification by specific organizations, individuals and stakeholders who have the mission and the social capital to engage the target group. Simply put, amplification creates the massive viral buzz that can make a message break out. Social capital is the new influence marketing. One hurdle to extending the message is in providing enough incentive for influencers to re-transmit the message via social media. One solution is to provide influencers a convenient, fast way to distribute the message (like Twitter), and to freely gift them with more social capital to exert their influence. Our use of Twitter is unique to media by providing community newsmakers with a media voice through our 400 city feeds. We amplify authorized influencers by RTing their tweets to our local readers when they use a designated hashtag like their city name (#chicago). When influencers are locally amplified, campaigns can reach a granular, community audience with a stronger degree of engagement because their connection is more trusted. With the #InfinityBoxes crowdfunding campaign (see tweet above), we’ve succeeded in exposing the artist and his work, the Infinity Boxes, nationally to the artist community, the arts media and museums nationally. Memorial Art Gallery at the University of Rochester (@magur in the above example) is collaboratively promoting the #InfinityBoxes campaign down to their local member base. 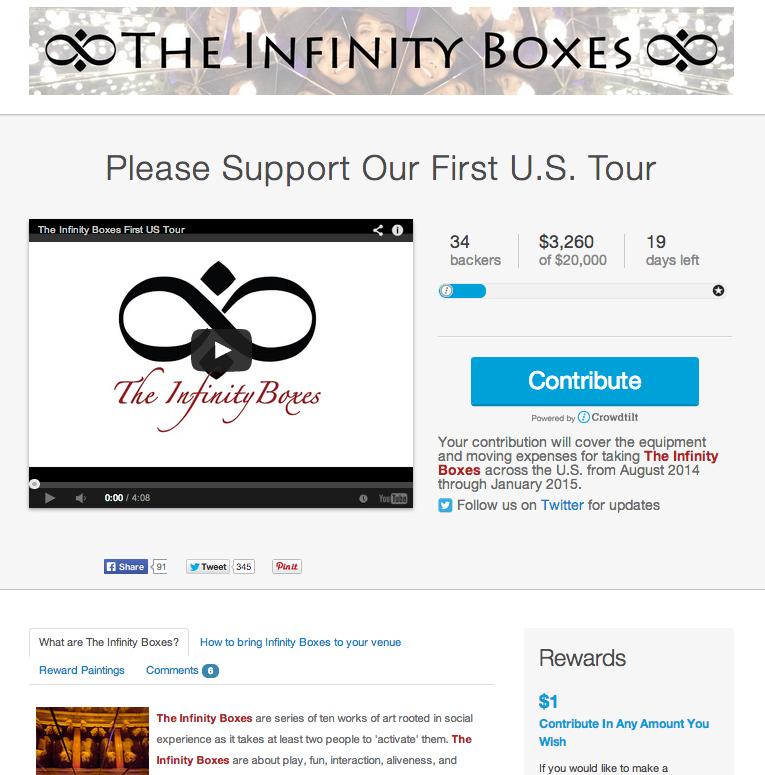 We extend the number of museums that promote the #InfinityBoxes campaign locally by leveraging the 300 museum media network we have developed. On #GivingTuesday 2013, a national movement designating the Tuesday after Thanksgiving a day of online charity, The BNN amplified #Giving Tuesday tweets over 8,000 times in one day reaching over 30 million at a localized level. In addition, we amplified the tweets of over 1,000 nonprofits that day across the country directly through our local feeds as a community service. We’re applying coordinated amplification to crowdfunding at BNN Funding, the first crowdfunding system that can get crowdfunding campaigns up to trending topics, and reach backers locally through established influencer networks. Since we already have the media network and the influencer network of over 7,000 community newsmakers in place, we can create and launch campaigns in 24 hours with full marketing support. This is unique to crowdfunding, which often involves months of preparation to prepare exposure and marketing.